Robert Harris has long had a fascination with the events surrounding Neville Chamberlain’s trip to Munich in 1938 to negotiate with Hitler. That meeting, which ended with Chamberlain famously returning to Britain waving a piece of paper and declaring “Peace in our time”, has long been seen as the epitome of the appeasement policy that presaged World War II. In 1988, on the fiftieth anniversary of that meeting, Harris was involved in a documentary called God Bless You, Mr Chamberlain. As the name of his documentary suggests, Harris has a more grey interpretation of Chamberlain’s actions than the popular historical account. And this view of the man and his actions informs much of his latest novel about these negotiations. Early on in Munich it is clear that in 1938 the British were not ready for a war. Chamberlain is told that that the country needs at least a year to recruit, train and arm their forces. So that while Chamberlain honestly strives for peace, desperately trying to avoid a repeat of Word War I, he is also aware of a need to stall for time. As he observes: “The main lesson I have learned in my dealings with Hitler is that one simply can’t play poker with a gangster if one has no cards in one’s hand.” In Harris’s telling, Chamberlain does everything he can to box Hitler in to an agreement, knowing it is possibly all futile. While full of historical characters the book itself is anchored around two fictional characters, both advisors to their respective leaders. Hugh Legat is one of Chamberlain’s private secretaries. Many years before, while at Oxford, he had a friendship with a German, Paul Hartmann who now works for the German diplomatic service. They have been estranged for six years after a falling out during Legat’s last visit to Munich, during Hitler’s rise to power, and events that hang in the background for most of the novel. Hartmann is part of a group seeking to bring Hitler down. He hopes to use Legat as a back channel to pass secrets on to the British and derail the Munich talks. So that while it is set against the backdrop of the real negotiations, this is a spy thriller, although one about amateur spies who are dedicated to a particular result but not very good at their craft. It is easy in a historical novel like this to presage future events and for characters to make gnostic comments about how their actions will impact on the future. Harris does not fall into this trap but his characters are not stupid, they know that war is coming even while they struggle to prevent it. But what Harris does well is use the historical context to shine a broader light one human behaviour. For example, passages where SS characters talk of making Germany great again, and observations on Goebbels insight that the people would believe what they wanted even if it wasn’t true. More generally, Harris highlights the dangers inherent in the rise of nationalism. 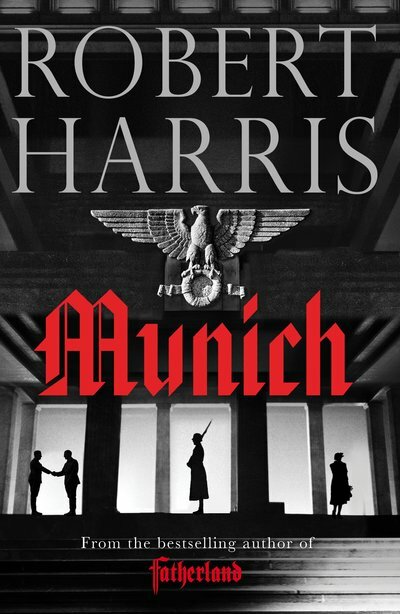 Munich shows once again why Harris is one of the best historical fiction and thriller writers going around. His grasp of the detail and the main historical players mean that while the outcome is never in doubt historically, interest is in the cut and thrust of the negotiation process and the interplay of the personal and the political. And in Munich, Harris managed to seamlessly integrate this fascinating historical milieu with relatable characters in an engaging espionage tale.